When Ryan Ruehl left the Marine Corps after five years of service as an artillery officer with two deployments, he knew he wanted to work in the medical device industry—something he’d been passionate about since high school. He already had a degree in biomedical engineering and his time in the Marines had given him the leadership skills to be successful. But several of his early startups failed. “It’s really, really hard to start a business with no support or like-minded people around,” he said. 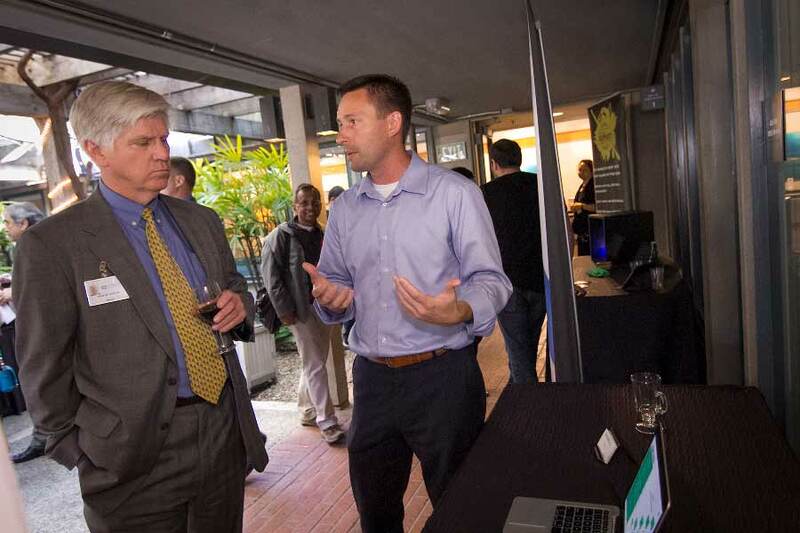 From left to right: Robert Smith and Ryan Ruehl discuss Braykion at the reception. Ruehl wanted to pursue an MBA in order to learn more about marketing, finance, strategy and entrepreneurship and enrolled at UC San Diego’s Rady School of Management. In what can only be called kismet, on his first day of school he struck up a friendship with fellow MBA student Dr. Jon Wilensky. That friendship led to the creation of Braykion, a tech startup that seeks to reduce hospital-acquired infections in patients through wearable devices. A year into it, they have secured an investor and expect to launch a pilot program at the Jacobs Medical Center over the summer. While Ruehl was able to find a pathway to success, his story emphasizes a common struggle among veteran entrepreneurs: they have ideas but no practical knowledge of the business world and no cohort to help them on their journey. This is compounded by acquiring skills in the military that are highly desirable, but difficult to translate into corporate America. Not all veterans are able to enroll in business school as Ruehl did. In order to better serve the men and women who have served our country, UC San Diego is expanding its already robust line-up of entrepreneur programs to include two specifically geared toward veterans: a Certificate in Entrepreneurship, operated through the Office of Research Affairs; and Veteran Ventures, an accelerator program offered by Rady School of Management. In a truly non-traditional move, veterans are not required to have any affiliation with UC San Diego and tuition is free. 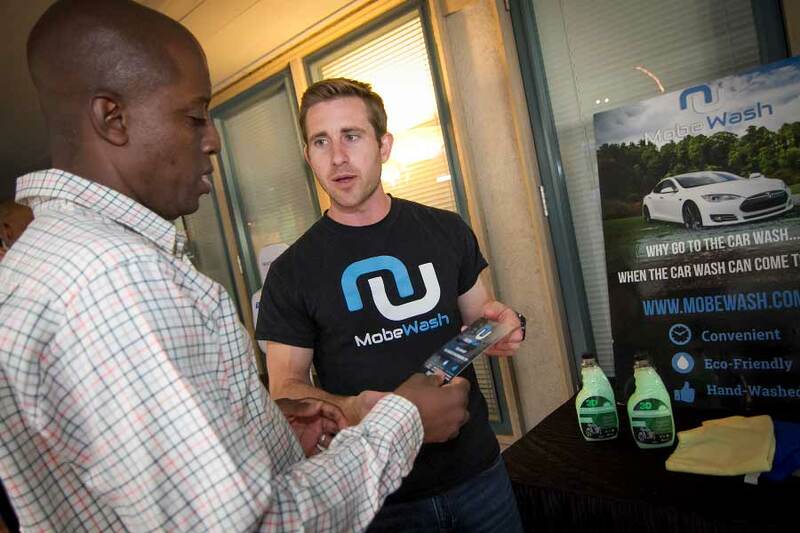 On right: Ron Baldwin discusses his business, MobeWash, at the reception. Research Affairs’ Office of Innovation and Commercialization is responsible for organizing and developing the certificate program, recruiting instructors, and finding venues for the classes. Vice Chancellor for Research Sandra Brown said she felt it was important that the university not just toe the line when it comes to veteran programming as much as redraw the line. 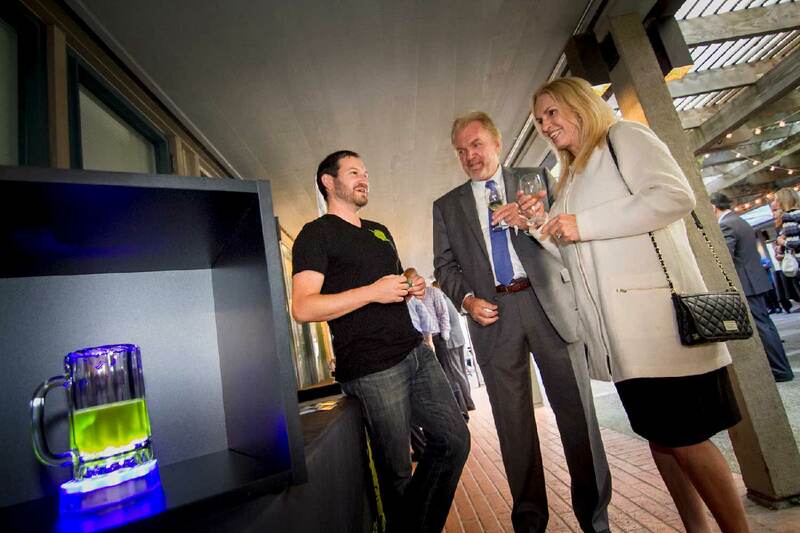 “At UC San Diego, we wanted to do more—to go deeper, be of better service. We are not just a veteran-friendly campus. We are a veteran-empowering campus,” she said. Veteran Ventures is geared toward veteran entrepreneurs who are ready to move from business concept to viable operation, and focuses on mentoring and coaching. The Rady School launched their first pilot program at the end of April and the response has been overwhelmingly positive. Vish Krishnan, a professor of innovation, technology and operations at Rady, is the current faculty advisor for Veteran Ventures. In his Lab to Market Workshop, he observed veterans struggle as they transitioned from the military to civilian world and thought they could benefit from extra resources. “The goal of the program is to help veterans receive inspiration, insight and seed funding to build and scale these ventures,” he said. Michael Hayden speaking at the reception. 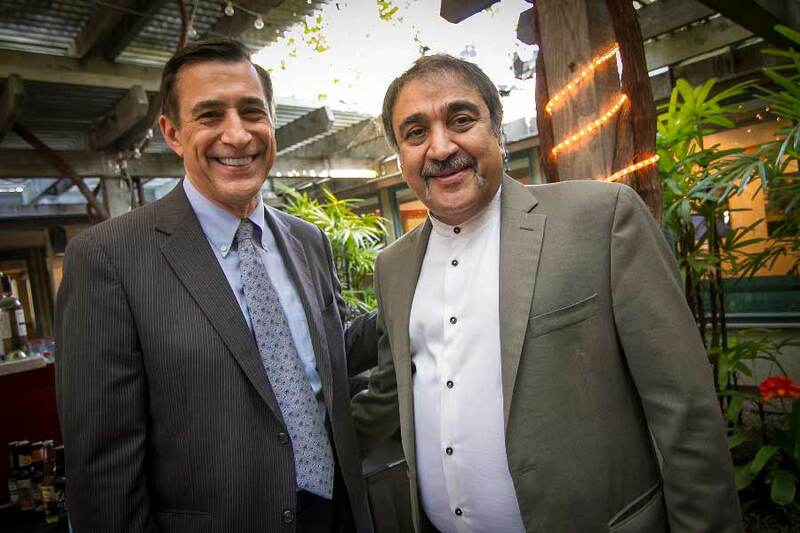 Darrell Issa and Pradeep Khosla at the reception. As a veteran entrepreneur himself, Congressman Darrell Issa spoke from experience: “As someone who is a veteran and who left the army more mature than I went in, there was no better place to use those skills than as an entrepreneur. But I made a lot of mistakes. I didn’t have any way to fill in the blanks of what I didn’t know. Now, those resources exist at places like UC San Diego.” Issa represents California’s 49th Congressional District, which includes Camp Pendleton, the largest Marine Corps training facility in the United States. 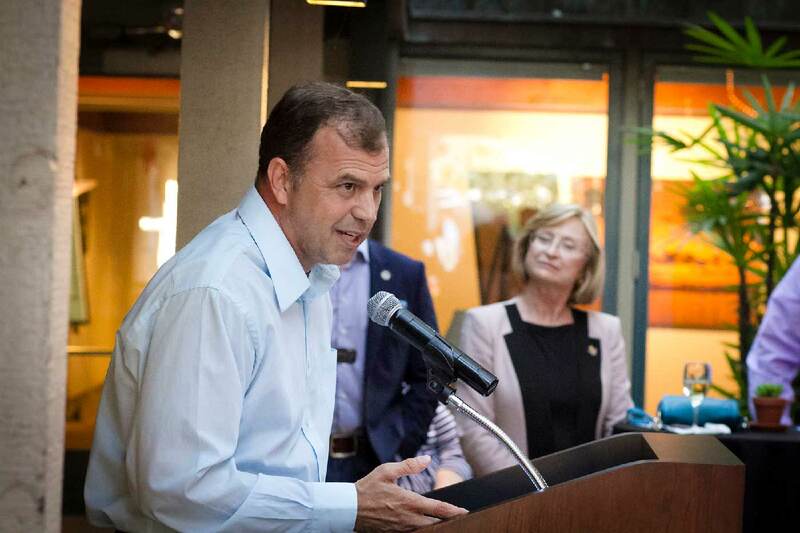 UC San Diego’s enhanced focus on military entrepreneurs deepens the already strong bond that exists between the campus and the veteran population. In order to better answer the needs of veteran undergraduates, UC San Diego established the Student Veteran Resource Center in 2013. The center seeks to ensure that military-affiliated students successfully make the transition to campus life and offers resources such as peer-to-peer support, mentoring and social networking.